The reporter/blogger "Shiao Shin" works for Apple Daily as a reporter for suddenly breaking incidents in southern Taiwan. As such, he writes reports that are published in his newspaper in accordance with the standard code of ethics and rules of journalism. However, in his blog, he is entitled to express his personal views what he could not get published in the newspaper. The following are two blog posts about his encounters with Tu Ming-yi (whom he refers to as Young Master Tu), who is the son of Taiwan Minister of Education Tu Cheng-sheng (whom he refers to as Old Master Tu). These encounters contain important lessons for public figures on emotional intelligence quotient (EQ). "Young Master Tu immediately explained what happened to the Mayor's Office and said that the facts were different from the media reports. He expressed his misgivings about how as the son of the Minister of Education, his personal life has been exaggerated and broadcast." On June 21 and August 21, there were reports about the deeds of Young Master Tu. On the next day, Young Master Tu gave his views to the Kaohsiung mayor and the mass of Taiwan citizens who care about him. "Shiao Shin, you must hurry over to Fuchien Road to see if there is a Porsche 911 illegally parked inside the yellow line. It is supposed to belong to Young Master Tu. He is taking a girlfriend to dine at a restaurant." At 8pm on June 21, I had just finished writing a society news report and I was ready to go to dinner. Suddenly, a telephone call came from Taipei because someone has called in a tip about seeing Younger Master Tu and wanted us to go and investigation. Even though I was hungry, I had to carry out the assigned ordered by Taipei. I got out there on my motorcycle. When I got there, there was a Porsche 911 which was illegally parked. I entered the restaurant, I walked around but I could not find Young Master Tu. The convener arrived shortly afterwards. He made a round of the restaurant and did not see Young Master Tu. But the policemen who were eating inside acted as our informers and said that Young Master Tu was still inside and that he drove the car down. So I and the convener decided to sit on the bench outside the restaurant and wait for the people to show up. 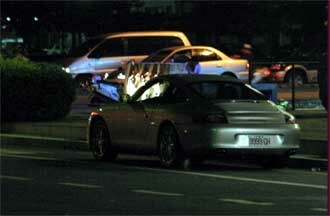 At around 10pm, Young Master Tu's friend Chou Shiaochou came out and approached the Porsche. The convener went up and asked: "Is this your car? Do you know Young Master Tu?" At that moment, Young Master Tu appeared, picking his teeth with a toothpick. The convener presented a business card to introduce himself and asked why the Porsche was parked inside the yellow line? "That sports car is not mine! You better not write about that or else I will sue you to death!" When Young Master Tu was asked about the Porsche, he flippantly tossed out these words. Then he started pacing around the front of the restaurant and asked the convener why we were there. Specifically, did we follow him here? The convener said honestly that we did not follow them but someone sent in a tip that Young Master Tu had parked a Porsche illegally and wanted the reporters to come to check it out. "We were asked by our superiors to do so, and so we had to come. Please do not misunderstand." When Young Master Tu heard what that, he did not seem concerned. I took the opportunity to speak to his friend. We also asked Young Master Tu whether we can take a photograph so that we can tell our Taipei office that we did handle the tip and then we can close the case. But Young Master Tu gave no indication one way or the other as he waited for his friend to show up with a car. About five minutes later, the friend came in a car and took him away. The convener picked up this camera to take a photograph, which was a spontaneous professional response. But Chou Shiaochou blocked him. The convener said instinctively, "Don't touch my camera." So Chou and the convener were at a stalemate while Young Master Tu left the scene. 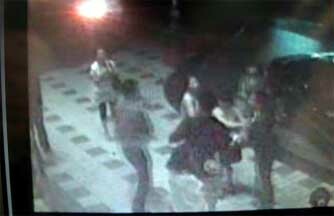 The convener tried to reason with Chou, who was intoxicated and physically damaged the camera. Also at the scene was Young Master Tu's girlfriend Shiao Pei, a female friend Lisa and myself. Chou Shiaochou would not let go of the convener. I called 110 to summon the police for assistance and then I used my camera to photograph from the side. The police arrived quickly from every direction and asked us what happened. We said that the camera had been damaged. The other party said that we were filming without permission. We said that we were entitled to take photographs in a public area. The deputy police station director asked us whether we want to press charges for the damage to the camera. We called our company which insisted firmly on pressing charges. So the convener and Chou Shiaochou were taken to the police station. Since the Porsche was still there, I wanted to know who the owner was and therefore I remained at the location. Shiao Pei and Lisa were also there. Two minutes after the police left, the intoxicated Young Master Tu and his friend re-appeared and wanted to drive the Porsche away. But they saw me and another colleague at the scene, and Young Master Tu took Shiao Pei's hand and left. Since the other side had been violent and Young Master Tu was yelling, I and my colleague decided to keep taking photographs until Young Master Tu left our field of vision. After all, he would not have appreciated it if we had been kind, and he would have fled otherwise. When Chou Shiaochou arrived at the police station, he seemed to have sobered up somewhat. He kept apologizing to us. But since we have asked to press charges for destruction of property, the police had to take down the statements. "Did Young Master Tu call you? Whose Porsche was it? What is your relationship to him such that you took action on his behalf?" Since Chou Shiaochou was apologetic to us, he answered some of the questions but not the one about the ownership of the Porsche. Would you say that Young Master Tu cared about Chou Shiaochou? Indeed he was. We heard the police station chief taking telephone calls of concern and being told that neither side must be offended. Furthermore, Chou Shiaochou must not be handcuffed. Shiao Pei's father and mother also appeared at the police station to show their concern. After we left, Lisa and the man who drove Young Master Tu also appeared. By that time, it was 1am and I had not eaten dinner yet. Frankly speaking, this was a simple case. The car did not belong to Young Master Tu. He did not assault anyone. I have no idea who leaked the news, but the television stations found out the next day. They called the convener immediately. For the purpose of balanced reporting, the television stations contacted Young Master Tu at the Kaohsiung city government office but he continued to be evasive. He said: "The facts are different from the media reports" and "the personal life has been exaggerated and broadcast." But I wanted to ask, "Young Master Tu, if you say that the news reports are different from the truth, then why don't you explain it? This affair caused me to give some advice to Young Master Tu: When you have a famous father, you should keep a low profile. When you encounter an incident, you should exercise some EQ to deal with it. If you are not the son of Minister Tu, I don't think that any citizen would tip the newspaper hotline. When the reporters come to gather news, we always identify ourselves and ask you questions . If you don't want to say whom the Porsche belongs to, you can just say, "That belongs to a friend. It is not mine." Or else you can decline to reply and leave directly. You do not have to yell at us and threaten to sue us to death. Otherwise, I would think that you wasted your time studying overseas because you may have acquired some knowledge but you learned nothing about basic personal integrity. (Part 2) "Young Master Tu got jealous and assaulted his girlfriend's family friend?" "Young Master Tu assaulted someone in Tainan!" On the morning of last Saturday (August 11), I was waken by a telephone call from the convener to the effect that someone had just tipped Apple Daily that our good friend Young Master Tu assaulted someone in front of a KTV in Tainan at 6am. This telephone drove away my sleepiness immediately. This would become by second encounter with Young Master Tu, and it would also allow our Old Master Tu tell us about "the bacteria in the microphones!" Back to the main theme. The tipster left the telephone number of the principal character. In order to show that Apple Daily takes the enthusiasm of its readers seriously, I had to give up the idea of continuing with my sleep. So I called the principal chiropractor. "Mister Ou, how are you. I am the Apple Daily reporter Shiao Shin. I heard that Young Master Tu assaulted you early in the morning? Were you injured? Did you call the police? Do you have any proof?" I asked a whole bunch of "Yes or No" questions. The reply from the other party was: "I am a family friend of Shiao Pei, the girlfriend of Young Master Tu. It was Shiao Pei's birthday yesterday. 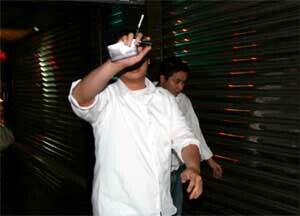 When we left the KTV, the intoxicated Young Master Tu and his friend assaulted me at the exit. They ripped my shirt and yanked my neck chain off. I called the police, but he eluded capture. The police has asked the business operator for the close-circuit television surveillance videotape. There should be a video clip in which he assaulted me." "There is a surveillance video of the assault." When I heard that, I perked up because a famous surveillance expert said: "You can say only as much as you have evidence for." (This comment is also dumb!) I posed questions to Mister Ou even as I constructed the logical flow of the news report. The stages were: Did Young Master Tu assault someone or not? Is there any video? Are there photographs? Was the police called? Was there really a surveillance videotape? How can I ask Young Master Tu? Although I was anxious to ascertain these cause-effect relationships, I had to wait because the police officer on duty will not show up for work until 8pm on Saturday and Mister Ou can only view the surveillance tape at that time. Only then can I verify whether Mister Ou was lying to me! But I could not wait until the evening. I had to hypothesize that the incident was real and use other channels to figure out the details of the case. 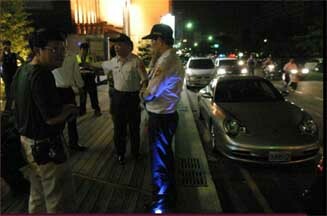 Yes, I could ask the police station whether there was a fight outside the KTV in early morning of Saturday. I went through my private connections and saw that the relevant records by the case officer indicated that "Citizen Ou was assaulted and filed a police reporter. We have asked the business operator to provide the surveillance tape. 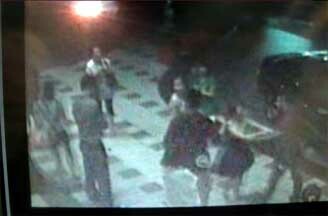 Afterwards, we will decide whether to file charges for assault." So this is true and Mister Ou did not lie. The next step is to sort out the relationships among the principal characters in the case. When Young Master Tu was reported in June this year for illegally parking his girlfriend's Porsche 911, I went with my colleague and I took several photographs of Young Master Tu and his friend. On that afternoon, I met with Mister Ou and I asked him to explain his connections with Mister Ou. I also wanted to see his ripped shirt and any sign of injury in verify the story. "She is Young Master Tu's girlfriend Shiao Pei and this is her girlfriend Lisa. That is Mister Tu's friend, who was the one who assaulted me." Mister Ou looked at the photographs that I showed him and detailed the relationship among the individuals. He described the entire incident in detail, which led me to be raise my confidence in his story to 80%. The remaining 20% would depend on the surveillance videotape and the explanation from Young Master Tu. During my interview, Mister Ou's telephone kept ringing. Young Mister Tu was going through friends to apologize to Mister Ou. Shiao Pei was also sending SMS messages to ask for the matter to be settled amicably. But Mister Ou was really angry at being assaulted for no apparent reason and he would not shut the case down. "They asked me to go at 3:30pm to meet downstairs from Shiao Pei's home. Do you want to accompany me?" Mister Ou wanted to invite me to go along and witness the confrontation with Young Mister Tu. But since Young Mister Tu had seen me before, and I also did not want this case to be exposed prematurely, I chose to watch from outside the building that Mister Ou had met with Young Master Tu. I asked Mister Ou to fill me in with the contents of the discussion afterwards. This way, I also made sure that Young Mister Tu cannot smear me. "I only have a minor issue. Younger Master Tu should not be able to beat me up publicly and then apologize privately!" Since the police had set up an appointment with Mister Ou at 8pm to decide whether he wanted to press charges, he decided that if Young Master Tu was sincere about an amicable settlement, they could go down to sign a settlement document down at the police station. This has to be a public apology and Mister Ou would not accept a private pat on the head from Young Master Tu. But Young Master Tu gave no indication. So that left the surveillance videotape which will tell whether the case was true or not. It would be even better if Young Master Tu could be there at the police station to watch the videotape. Since this was going to take place at 8pm, I took the available hour beforehand to sketch the news report while leaving only behind Young Master Tu's statement and the description of the surveillance videotape. Of course, it was also crucial whether Mister Ou decides to press charges or not. In the final analysis, if Mister Ou pressed charges, then this was a police crime story; if Mister Ou did not press charges, then this was 50% a society story and 50% a police crime story. "That is me. That one is Young Master Tu. That one in the evening gown is Shiao Pei. You can see that he yelled at me first and then he assaulted me." At 8pm that evening, I accompanied Mister Ou to the police station and I watched the videotape with him. The familiar figure of Young Master Tu appeared in the videotape. As the cliché goes, "you can turn into ashes and I will still recognize you." Young Master Tu struck two blows. His good friend Chou Shiaochou, who damaged the convener's camera, also assaulted Mister Ou towards the end of the action. This proved that Mister Ou was telling the truth. Young Master Tu also called Mister Ou and said that there were city legislators present at the police station and therefore he did not want to go there to sign a settlement document. So I realized that Young Master Tu would not come, and I had to try my best to get the photographs of the surveillance videotape. The police said that an ongoing investigation should not be aired. It did not matter what I said, but I was not going to get it, never mind a duplicate copy. At that moment, I contacted my civilian friends and I got the reply after a few telephone calls: "Alright, Shiao Shin, it's alright. You just wait for the email because the photographs will be there." After I got the photographs, I immediately called Apple Daily, but my supervisor did not seem to have seen the photographs. He instinctively felt that this was untrue and he even sounded lethargic. But I kept on with the job, stayed at my post and worked diligently (these stage scripts seem silly). I asked Mister Ou for the telephone number of Young Master Tu and I went home to work. At 9:30pm, I sent out all the photographs. My superior wondered whether Young Master Tu really assaulted someone. "I guarantee with my moral character that this is true. 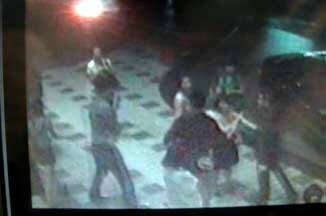 The surveillance videotape showed that it was Young Master Tu, whom I have met previously!" Since the surveillance videotape had been duplicated, it was not as clear and therefore my superior was still wary. I had to issued more assurance, although I never quite got around to saying: "If this is fake, then I will be out of a job tomorrow!" The writing of this news report continued until 11:30pm. 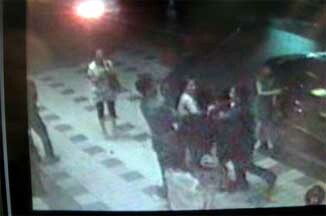 During this time, television colleagues learned about what happened with Young Master Tu and called me. I begged them to let me have my exclusive story but they can follow up the next day. Fortunately, all the television colleagues agreed. That was the reason why when they could not obtain the surveillance video the next day, I rewarded them with the video that I had obtained through special channels. "Young Master Tu assaulted his girlfriend's male family friend" was more or less produced in this manner. You may say that we were biased with respect to Young Master Tu, but I believe that we were just reporting honestly after verification. As for Young Master Tu, how come every time that you encounter something, you never confront it earnestly and explain it? ... People get emotional some times because some things are intolerable and you resort to physical action. When you make a mistake, you admit fault and apologize. When you encounter a decent person, you will be forgiven. Besides, if you were sincere and honest and the other party was still demanding, bystanders will jump out to support your case. Most people believe that "when you are right, you should forgive." Most people will not agree with "when you are right, you should be unforgiving." You should never make mistakes publicly but only apologize privately. This will only make people think that you are no gentleman and you are just an insufferable commoner.